1. DIY a power supply, input 12V and output can be adjustable to 12-50V. 2. Charge for your electromobile. 3. As the car power supply, charge for your laptop, PDA or a variety of digital products. 4. DIY a notebook mobile power supply: with 12V big-capacity lithium battery pack, get your notebook on anywhere. DROK boost voltage converter input voltage range is DC 10-60V, continuously adjustable output voltage range is DC 12-90V, max output current is 20A, more than 15A please enhance heat dissipation. 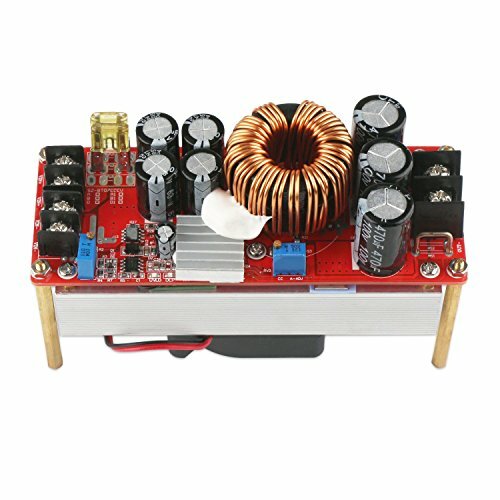 Application: DIY a power supply, 12V can input and output can 12-50V adjustable; as the car power supply, charge for your laptop, PDA or a variety of digital products; Solar panel regulator etc. Protection: the step-up power regulator is designed with input over-current protection, battery low voltage protection, input MOS reverse polarity protection, short circuit protection. Speacial Design: the voltage transformer is equipped with thickening radiator and intelligent temperature control cooling fan. Note: it is necessary to lower the battery protection voltage, no matter using the battery, switching power supply, solar panel, or generator etc as the input source, otherwise it will damage the battery and power module.